IPVision executive and advisory team member Alex Butler is a featured speaker at this year's IP Business Congress in Boston. From his perspective of working with senior executives and their counsel, Alex will discuss the changing face of the IP market, how this is modifying corporate and investors expectations for IP departments, and how (whether in an IP legal unit or in a IP business unit) new management techniques and incentives are being deployed. Whether in-house IP departments are cost or profit centers is a perennial question. One way to find answers is to demonstrate the value they bring. In "Why the US Patent Office is a National Problem" Fast Company published an excerpt from the recently published book “Great Again” on June 9, 2010. 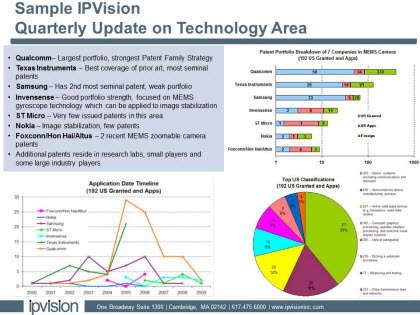 The article further discusses the difference between merely having IP and developing well-positioned, strong, high-quality IP rights, including references to IPVision’s analytics into the correlation between patent quality and patent positions and venture capital success. As we approach annual performance reviews and strategic planning milestones, we invariably focus upon management systems and metrics. One of the most important themes that we observe in R&D and patent departments is that leading organizations are shifting from measures of patent “throughput” to measures of patent quality. How often do you hear the phrase “if we cannot measure it we cannot manage it”? Or, think about how your organizations (or your clients) consider IP issues too late in their processes? Is it perhaps that we fall into the trap of experts seeking a fundamental answer (I.E., is this patent valid and infringed) while the better question is to find directional indicators and measurements that support focused review, collaborative inquiry, and the advantage of unique insights and perspectives into broader business processes and decisions.